On Saturday, January 27, 2018, the Mid-Peninsula Recorder Orchestra will present a workshop entitled “Master and Student.” The workshop, directed by Rotem Gilbert, will explore the music of Franco-Flemish composers, illustrating the relationship between famous teachers and their equally famous students. Music by Isaac, Senfl, Josquin, Gombert. Willaert and Gabrieli will be featured. Rotem Gilbert is a recorder and double reed player as well as a specialist in early Renaissance music. 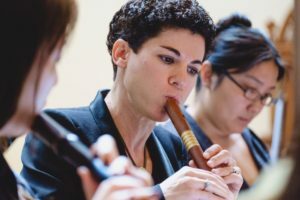 She currently teaches baroque and Renaissance performance practice as well as music history at USC’s Thornton School of Music and is an instructor of early winds. She has served as co-director of the San Francisco Early Music Society Recorder Workshop and is a recipient of the Thomas Binkley Award for her performance of early music and scholarship. The workshop will take place at the Good Shepherd Episcopal Church Parish Hall, 1300 Fifth Avenue in Belmont from 9:30 a.m. to 4:30 p.m. The workshop is open to recorder players from the intermediate to advanced level. Workshop fees are as follows: MPRO, SFEMS and ARS members, $50.00; non-members, $55.00. Please plan on bringing a music stand and a lunch. Snacks and beverages will be provided. Advanced registration is encouraged as space is limited. For further information or to register for the workshop please visit the MPRO website at http://mpro-online.org/ or contact Leslie Pont at 650-941-3065. The Mid-Peninsula Recorder Orchestra is an affiliate of the San Francisco Early Music Society.